"Far from being anxious to condemn, our Heavenly Father and our Savior seek our happiness and plead with us to repent, knowing full well that 'wickedness never was [and never will be] happiness' (Alma 41:10). So Ezekiel and every prophet before and since, speaking the word of God out of a full heart, have warned all who will to turn away from Satan, the enemy of their souls, and 'choose liberty and eternal life, through the great Mediator of all men' (2 Nephi 2:27). "The motivation for raising the warning voice is love—love of God and love of fellowman. To warn is to care. 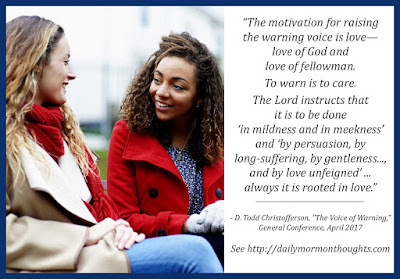 The Lord instructs that it is to be done 'in mildness and in meekness' (D&C 38:41) and 'by persuasion, by long-suffering, by gentleness..., and by love unfeigned' (D&C 121:41). It can be urgent, as when we warn a child not to put his or her hand in a fire. It must be clear and sometimes firm. On occasion, warning may take the form of reproof 'when moved upon by the Holy Ghost' (D&C 121:43), but always it is rooted in love." 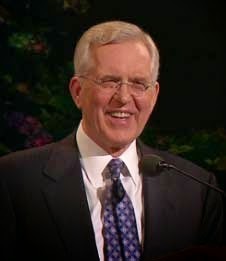 Elder Christofferson offers an invitation to all that we raise a "warning voice" to those around us. But he clarifies what that means; it focuses on invitations based on love and concern for others, including those close to us. At times the warning voice needs to be urgent and even reproving, but usually it is kind and gentle, showing a desire to share knowledge that is precious and valuable. When we feel the motivation of caring and concern for our neighbors, the warning voice is a natural result. "To warn is to care." That's a beautiful summary of Elder Christofferson's message.